Osteoporosis is a condition involving the thinning of bones (bone demineralisation), leaving them brittle and more susceptible to fracture. Ninety nice percent of calcium is stored in the bones, so sufficient calcium is important in order to maintain or reach peak bone mass (PBM). The older population are more at risk of osteoporosis because bones naturally become thinner as we get older. Post-menopausal women are particularly at risk of osteoporosis because of the decrease in the female hormone, oestrogen. Those with higher salt intakes are increasing the amount of bone demineralisation that takes place. Studies have also demonstrated that there is a correlation between salt intake and calcium excretion in young and adolescent girls. It has been suggested that this may result in a reduced peak bone mass, which would increase the risk of osteoporosis later in life. Consuming a low salt diet during adolescent years may therefore be important, to reduce the risk of osteoporosis later in life. Studies dating back to the 1980’s have found possible links between salt intake and urinary calcium (Ca) excretion. 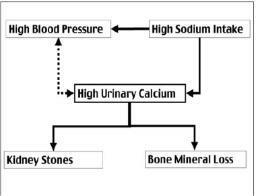 A high salt intake increases calcium losses in the urine (calciuria), some of which will be directly from the bones. One study found that for each 100mmol increase in salt intake, urinary Ca is increased by 1.4mmol. (2,3) If this loss is assumed to be from the bone, then this equates to about 1% extra loss of bone each year. (4) Over extended periods this would lead to the weakening of bones and ultimately osteoporosis. Salt intake and blood pressure are strongly linked, and it is also believed that patients with high blood pressure excrete more calcium in the urine and are, therefore, at higher risk of osteoporosis and kidney stones. Recently, a study7 showed sodium to be a major linking factor between blood pressure and osteoporosis. 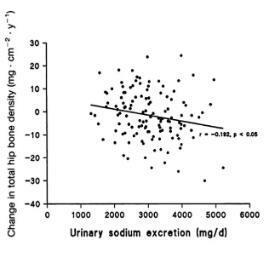 The authors found that hip and spine Bone Mass Density (BMD) were inversely correlated with a higher sodium excretion, i.e. the higher the salt intake, the lower the BMD. They concluded that the increase in calcium excretion is obligatory as a result of the increased sodium in the diet (Fig 2). Another study8 showed that a 20mmHg increase in BP is associated with 0.28mmol/day increase in Urinary Ca. Almost everyone in the UK (and the rest of the Western world) eats too much salt. The daily recommended amount in the UK is no more than 6 grams a day; the current average salt intake is 8.6g salt a day although many people are eating more than this.